In 10 March 1897, a scientific research expedition ship Belgica got stuck in ice in the Antarctic waters. On board the ship was a Polish scientist Henryk Arctowski, who made notes of optical phenomena during the ship's one year and 3500 kilometer drift with the ice. His book of these observations, "Phenomenes Optiques de l'atmosphere", is now online ( 1 ). Shown above is his most well known halo observation, the one with the "Arctowski arcs" that in the drawing rise from the horizon at about 120° from the sun. There are also other peculiarities, for Arctowski reports the patches of h to be 26 - not 22 - degree radius from the sun and the circumzenith arc distance from the zenith to be 28-29 degrees, which is probably more than it should be at the observation's sun elevation. But if we leave the measurements aside and look at the drawing, the sunside of the sky looks pretty ordinary. The Arctowski arcs, which he writes as being faint, could be misplaced 46° infralateral arcs. And the rainbow in the opposite sky could be a fogbow. So, nothing extraordinary there, except maybe for the fogbow, that still has not been captured on film with halos in naturally lighted conditions. 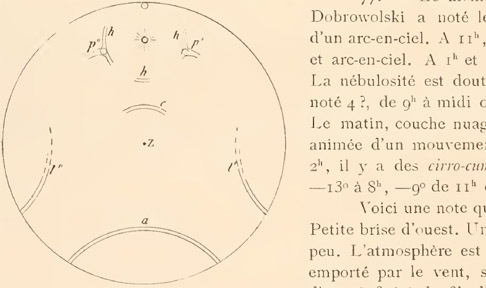 Any French speaking readers here who could translate Arctowski's account of the display (PDF page 40-41)? It looks like he had made some interesting notes on the halos showing up in nearby crystals. I can add it here. It may well be that Arctowski really saw and misplaced the infralateral arcs. Interestingly, a very high quality Parry xtal swarm with a low elevation light source could theoretically produce arcs that bear some resemblance to these. It is virtually certain that Arctowski did not see those, but if they are ever observed (which I believe they will be, at least while some of us is still breathing) they will perhaps be called "Arctowskis" just because of the resemblance. As an aside, I have an original copy of this publication in my bookshelf, thanks to Riikonen letting me know there was one available some time ago. Yeah, you are right, when those are observed, they might stick with the name Arctowski arcs. But those arcs are just one component of the already photographed "Ounasvaara arc". So, it looks like Ounasvaara arc will disappear and become one component of the Arctowski arc. By the way, one of our readers is looking to translate Arctowksi's description of the display. So, folks, stay tuned, I will add it to the post once I get it. To be precise, I did not see the Ounasvaara arc. Noticed it from the photos in both displays. Probably would have been too faint see even if I had known what to look for. Anyways, if you get the Arctowski component and Jukka gets another component and Jarmo again another, then we can start calling this halo the "nen arc". Haha, the nen-brigade strikes with full force!